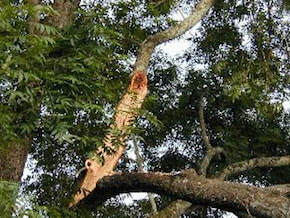 Strong storms, especially hurricanes and tropical, can cause massive tree damage in Florida. Widespread damage can occur throughout northern Florida and be a headache for homeowners. For most property owners, the tree damage can be beyond their ability and desire to clean-up. Additionally, such clean-up efforts are often hazardous given the trees' size and the potential for further damage to property. Add to this difficulty, most tree business in Pensacola will be swamped with business causing significant delays in getting your property cleaned up. Lastly, even if you find a tree company that has time, many will price gouge during these situations. This can leave many homeowners unhappy and with less money that is necessary. Pensacola Tree Service augments our crews during these storm periods to enable us to surge to meet the demand. Further, we never inflate our ratings during storm damage clean-ups. And, we provide 24x7 emergency service when you need tree damage service now! When you have tree damage, contact us for a fast, free quote. We will have one of our estimators at your home or business quickly to go over the tree service effort required. We will give you a quick on-the-spot quote followed-up with a written quote via email. We can get you scheduled the same day as the estimate and often can have a tree service team on your property within a day or two of your call to us. When our crew arrives, they will re-review with you the project and then rapidly get to work to clean-up uprooted trees, damaged trees, broken limbs, and other tree debris. We will haul away all the wood, or if you like, cut it into three-foot sections and stack it. For smaller branches and debris, we will eliminate it with our wood chipper and dispose of in our dump truck, or again if you like, we can place it anywhere on your property for you to use as compost or mulch. If you are thinking about cleaning up your own property, contemplate the skill and equipment required to manage downed mature trees. The job typically exceeds the property owner's ability and equipment. Additionally, managing larger jobs can take weeks if you have only 1 or 2 people to do it, Please do not waste your money, time, and safety - contact Pensacola Tree Service to make quick work out of any sized tree damage situation you may have. We have the equipment, experience, labor, and qualifications to efficiently, quickly, and cost-effectively dispose of all tree damage on your property. Lastly, we are licensed and insured so you are protected from any liabilities that may occur. Please know that you always have a choice in Pensacola when it comes to tree service. You may think you need to select the first tree business that has time given every other companies are booked weeks in advance. Just contact us to learn you still have an outstanding choice when it comes to immediate, responsive tree damage services. We will never price gouge or otherwise deal with you unfairly during these times of need. We stand by all our tree service work, to include our emergency service, with a 100% client satisfaction commitment.